Paul Smith Children’s Village, Cheyenne Botanic Gardens, Cheyenne, Wyoming. Photo by Barb Gorges. Have you thought about a career in horticulture? Last fall, the White House announced the “America the Bountiful Initiative” because the number of students currently studying agriculture is not meeting real world job demand. That in turn is causing potential vulnerability of the food supply which is a national security issue. A U.S. Department of Agriculture study in 2015 showed that 35,400 students graduated with ag-related degrees in a year, short of the 59,000 job openings. Under the program, government agencies, universities and corporations are encouraged to offer incentives: fellowships, scholarships, traineeships and awards. Sounds like promising career territory, so let’s look at the aspect of interest to gardeners: horticulture. Horticulture is partly agriculture and although everyone seems to have a different definition of the distinction, horticulture seems to cover everything that’s not large field grain crops or livestock, but includes flowers and landscape plantings. I decided to talk to Tyler Mason, the horticulturist at the Cheyenne Botanic Gardens, to get a better understanding of the field. His career so far exemplifies the possibilities both in educational routes and job opportunities. Kids will always play in the dirt, but Mason turned that into gardening early on. By age 12 or 13, “I was landscaping for neighbors: mowing, weeding, mulching and planting shrubs. I didn’t think it was work,” he said. Later he began working at a neighborhood landscape nursery. He took internships at a retail landscape nursery and scouting for pests for an agronomy company. Then he had an internship at the Purdue Horticulture Greenhouse Gardens (more of a public garden). After he graduated, he was working in horticultural research at Purdue, but he wanted to work in public gardens and see more of the world. That’s how in 2012 he came to be the assistant education director at the Paul Smith Children’s Village, part of the Cheyenne Botanic Gardens. Not only was he teaching, Mason was also responsible for the gardening, with the help of volunteers. An affable man, he can inspire both people and plants to do their best. And he’s also full of energy. In 2014, Mason signed up for a master’s program at Colorado State University through distance education. His thesis was on volunteer management and he finished within two years. During that time, he became the Cheyenne Botanic Gardens’ horticulturist that is responsible for everything that grows outside the conservatory—the planting and care of the whole nine acres of themed gardens located within Lions Park. But now Mason is about to embark on a different tangent. This month he begins work on his doctorate. This time he will go to school fulltime at CSU. In four years he will become a doctor of horticulture. He will be studying specialty crops grown organically and sustainably. Specialty crops, Mason said, are essentially all that produce you see at farmers markets minus grains (agronomy), wine grapes (viticulture) and fruits of orchards (pomology). The Northern Organic Vegetable Improvement Coalition has enlisted northern land grant universities like CSU in researching varieties that do well within the USDA’s specifications for organically grown food. Part of the evaluation is taste. There aren’t many fields of research where you get to eat your subjects. Which of the many careers in horticulture is Mason looking at when he finishes? Perhaps he’ll be a university extension service vegetable specialist for a state, preferably in the Mountain West, who would consult with growers. Let’s hope he still has time for his own vegetable garden. The green industry, as it calls itself, employs people with all levels of education and experience. While Laramie County Community College does not offer a two-year degree in horticulture, it does offer an associate of science degree that includes courses required for a four-year degree at other schools. Meanwhile, at the University of Wyoming, in the College of Agriculture and Natural Resources, the Plant Sciences Department offers the “Bachelor of Science Degree in Agroecology.” That is the study of more sustainable agricultural practices. Courses offered include landscape design, plant materials and their propagation, organic food production, turfgrass science and greenhouse design and maintenance. Other courses, for plant protection, include agronomy, plant genetics, plant pathology and weed science. –Environmental Horticulture which includes everything to know for landscaping, including business, design, management, nursery and turf management. –Horticulture includes the horticultural version of business management, food crops, science, and therapy (requiring classes in counseling) as well as floriculture (flowers), viticulture (wine) and enology (wine making). –Landscape architecture studies the relationship between design, nature and society. Buried in the online catalog you will find the Organic Agriculture Interdisciplinary Minor, www.organic.colostate.edu, in which one studies organic food and fiber production, composting, diagnostics and treatment, microbiology for sustainable agriculture, organic soil fertilizers, crop development techniques and organic greenhouse production. One doesn’t have to be a horticulturist to work in a horticultural business, though some knowledge of the discipline will help, and eventually rub off on you. Consider the Cheyenne Botanic Gardens. In addition to the horticulturists and the volunteers who grow the plants under their direction, the public garden has employees covering education, volunteer coordination, office management, community relations, and events management. There are many categories of horticultural work. In which category will you find your first career, or maybe your second? Categories: Gardening, Horticultural careers, Horticulture, Public gardens, Uncategorized | Tags: agroecology, agronomy, America the Bountiful Initiative, Cheyenne Botanic Gardens, Colorado State University, garden, gardening, green industry, Horticultural careers, Horticulture, landscape architecture, Northern Organic Vegetable Improvement Coalition, Paul Smith Children's Village, pomology, Purdue University, specialty crops, sustainable agriculture, Tyler Mason, University of Wyoming, viticulture | Permalink. I’m not sure what our son Bryan had in mind when he ventured forth with his toy shovel–digging to plant something, or digging to escape? “Winter interest” is a term you can Google. You’ll get sites wanting to sell you plants that flower in winter—in Zone 10, in Florida. Or maybe you’ll find Minnesota garden columnist Evelyn Hadden’s viewpoint that winter interest is anything that pokes up through the snow. Cheyenne isn’t the tropics or the snow-covered north. Though we have at least seven months between the first hard frost of fall and the last in spring, we can be snow-free much of the time. Winter interest is about the view from your window, rather than the summer experience of being in the garden. It’s about enjoying more subtle textures, such as different kinds of bark; and shapes. It’s about the sculptural qualities of branches. It’s about color, of which there is more than you might think. 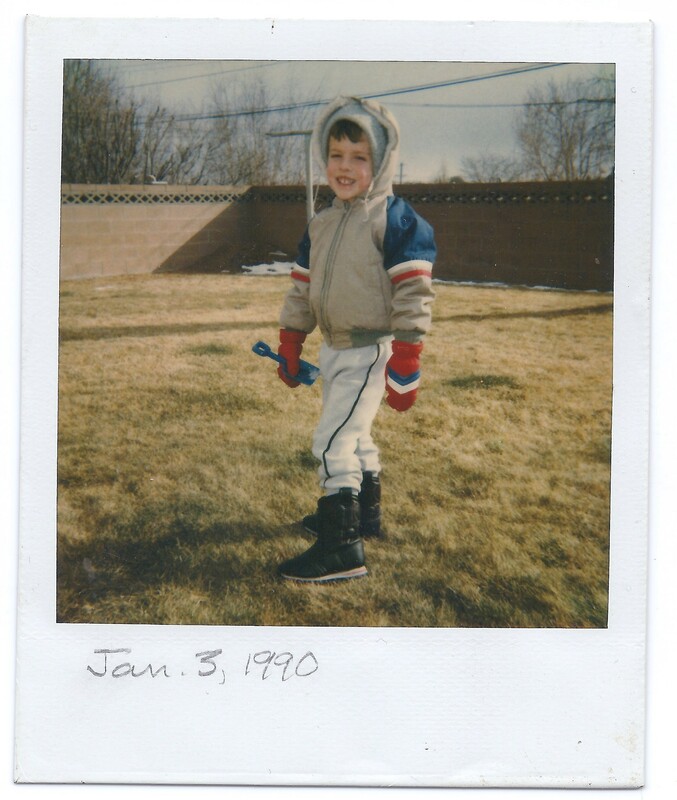 Although our house was already 25 years old when we moved in, the winter view of the backyard was bleak: a flat lawn, clothesline poles, two big tree trunks, and all walled in by pink concrete block. Sending the kids out to play reminded me of sending them into a prison yard. It’s improved now with various plantings, but maybe it could be more interesting. The spruce hedge at the entrance to the Cheyenne Botanic Gardens tapers towards the top so lower branches won’t be shaded and die. In the background is the columnar-shaped Woodward Juniper. Photo by Barb Gorges. In early December, on what he calls a 50-50 day, 50 degree temperature and 50 mph wind, Shane Smith, Cheyenne Botanic Gardens director, and I discussed winter interest and took a tour of the gardens looking for it. The backbone of any Cheyenne garden is the evergreens, providing a backdrop and wind protection. At the entrance to the gardens’ greenhouse, a thick blue spruce hedge about 8 feet high blocks the view of the parking lot. It started as a row of young, normal spruce trees planted 3 to 4 feet apart, but it’s pruned every year, forming an impenetrable wall. It’s important, Shane pointed out, that the hedge taper, becoming narrower towards the top. Otherwise, the lower branches are shaded, don’t get enough sun and die off. Besides the typical Christmas-tree shapes, we saw a weeping variety of spruce, developed from trees that are naturally prostrate but can be trained to reach a certain height before cascading. Junipers perform several functions. Low-growing varieties become ground covers, but Shane said to skip the really low kinds, only 6 inches tall, because they allow weeds to grow up through them. 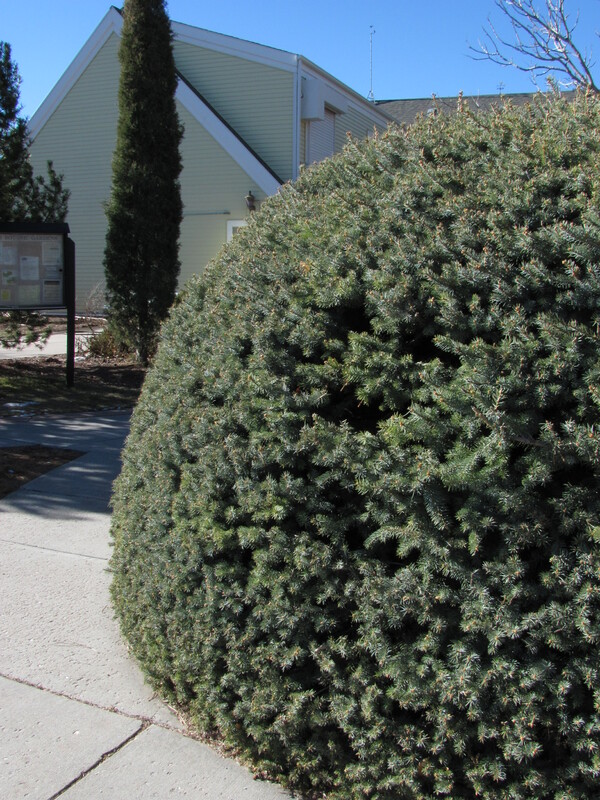 Another, the Woodward juniper, developed at the old Cheyenne horticulture station, grows tall and narrow, providing a columnar shape that doesn’t take up much ground, and it’s a brighter green than some of the other, shrubbier junipers. 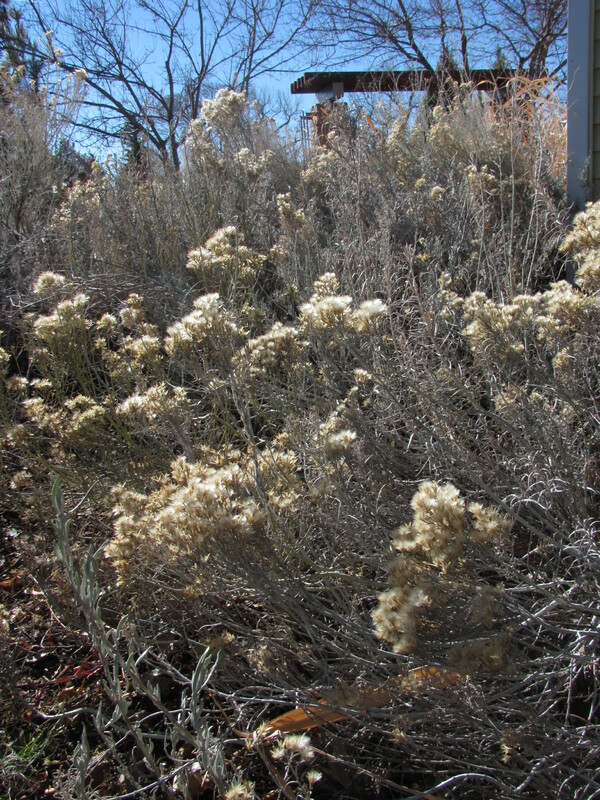 Rabbitbrush is a native adapted to Wyoming’s dry climate. More moisture than regular rainfall will kill it. pale-colored seed heads persist. The leaves are evergreen. Different varieties can range from a yellow green to a silvery color. You can also check out sagebrush, the epitome of Wyoming’s open spaces, which has silvery leaves year round, plus that quintessential Western smell when you brush against it. However, both of these natives need to be planted where they won’t be irrigated. More moisture than our natural precipitation can actually kill them. It’s easy to think bare branches will be just black silhouettes. But with our abundant, sunny winter days, there is more to see, from gnarly cottonwood to smooth redtwig dogwood. Shane said to keep in mind that for dogwood and other shrubs with colorful bark, only the younger wood will show much color, so it is important to prune part back, close to ground level, every few years to encourage new growth. Maybe you can choose trees and shrubs with fruit, red rosehips on rose bushes, orange berries on mountain ash, crab apples that cling after the leaves fall away—though how long they last will depend on how hungry the squirrels and birds are. “Karl Foerster” is an ornamental type of reed grass. There are several varieties. This one grows 2 feet tall. Photo by Barb Gorges. Other plants Shane recommended, some of which are growing at the gardens, are ephedra, with its weird bunches of long, match-stick-like twigs; mahonia, which reminds one of holly; mountain mahogany and various hawthorne trees. Ornamental grasses have become part of the professionally designed landscape, including the entrance to the Laramie County Library and many local businesses. They dry to a nice tawny brown. Unlike other, stronger vegetation, they require only the lightest of breezes to accent the view with motion. One kind Shane pointed out at the gardens is a variety of Karl Foerster grass growing in a 2-foot tall clump with feathery seed heads. 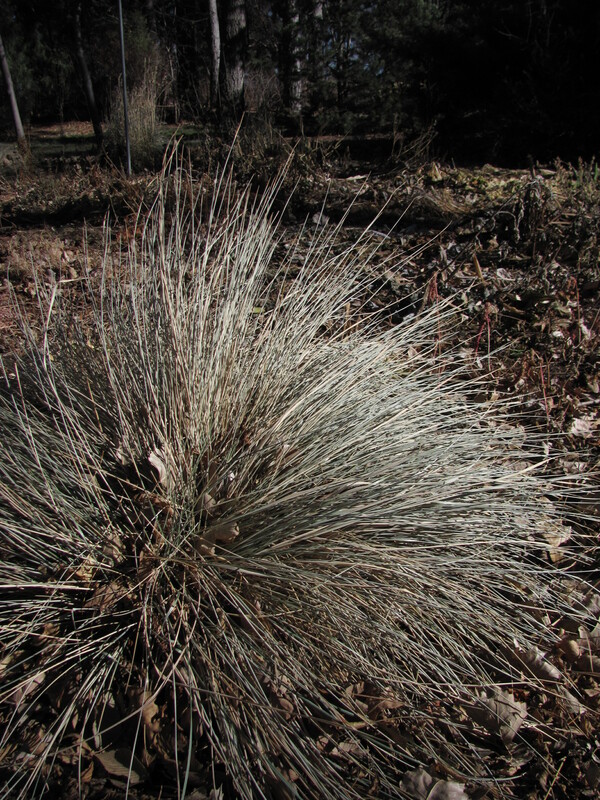 Another, blue oat grass, resembles a fountain of thin, bluish-green and silver strands which looks good as a lone specimen or as a herd of small, shaggy beasts. Shane said if you have a protected, south-facing exposure, there are other grasses you might try. 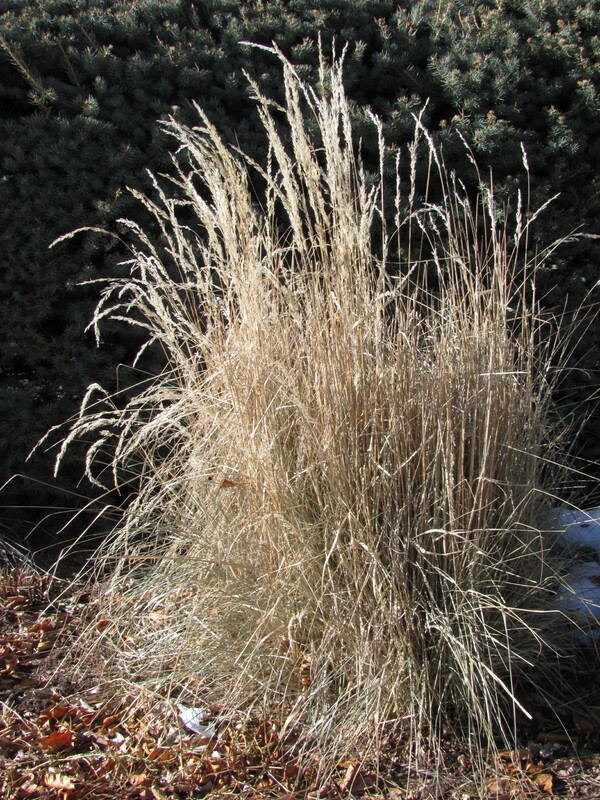 Blue oat grass has a fountain-like look. This specimen measures about 2 feet across. Photo by Barb Gorges. If, at some point, the grasses are smashed by snow or it’s closing in on spring green-up, it’s time to cut back the tall grasses. Rather than clipping them, Shane simply grabs a bunch and saws through near the base with a small, folding pruning saw. Vegetable gardens are rather hopeless looking in winter. A good gardener cleans out all that stuff that turns slimy with the first frost. But maybe you left the sunflowers for the birds. Some perennial herbs have winter color: silvery-looking sage (the cooking kind) and purple-y oregano. And some even stay green. In the perennial flower bed there are lots of plants that don’t need to be cut back right away. Black-eyed susans, yarrow, and asters have interesting dry flower heads. In my garden, hollyhocks and mullein have big stalks that attract downy woodpeckers. At the gardens, Shane and I found a clump of golden stalks with dried purple flowers, some kind of ornamental onion. And there was a sedum that had dried nicely. But there will come a time when some of these dried points of interest break down and you will want to remove them. Next fall, before heavy frost, get some of those early spring bulbs planted, even if it is just a handful here and there. Finding a crocus in March makes two more months of snow potential much easier to bear. We still have bluegrass lawn at our house. Where the wind doesn’t blow off the occasional snowfall right away, it gets moisture and looks quite presentable. Native grasses look nice too. Vinca, a vining ground cover, stays green, as do the leaves of some other low-growing perennials. Use organic materials as mulch to cover bare spots around trees or in gardens. It’s good for the soil as it decomposes, and it can be interesting to look at, whether it is dried leaves or bark, natural or dyed color. Shane likes the look of pine needle mulch. He’s found if it’s ground up a bit, it doesn’t blow away. Nothing says calendar page photo like snow gathering on a garden bench, wagon wheel or split rail fence. My favorite embellishment is a bird feeder or two, attracting bird color and movement and, even through window glass, cheerful bird sounds. 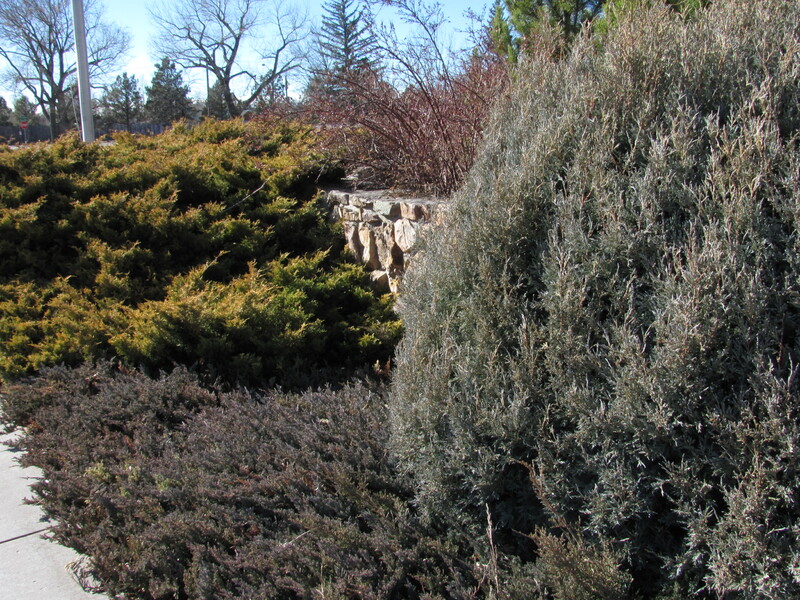 Three varieties of juniper contrast with each other in color as well as growth habit: shrubby, ground cover and upright. Photo by Barb Gorges. Go to the Cheyenne Botanic Gardens’ website, www.botanic.org, to the Gardening Tips section, where you will find lists of plants that grow well here. Categories: Gardening, Public gardens, Winter interest | Tags: Cheyenne Botanic Gardens, conifers, dogwood, gardening, Juniper, ornamental grasses, rabbitbrush, sagebrush, Shane Smith, shrubs, spruce, winter interest | Permalink.